Easter is the celebration of spring, and in Italy this means eating eggs and lamb. Even though it is snowing and Easter is colder than Christmas this year and therefore there is no suckling lamb available yet, I am following that tradition by preparing Abbacchio a Scottadito. This is a piatto tipico from Lazio, the region of Rome. Abbacchio means suckling lamb, and although the dish is still called abbacchio it is more usually prepared with regular lamb. The lamb should be as young as you can find; the lamb I used was 4 months old. The people of Rome have a colorful way of naming their dishes and describing how delicious they are. 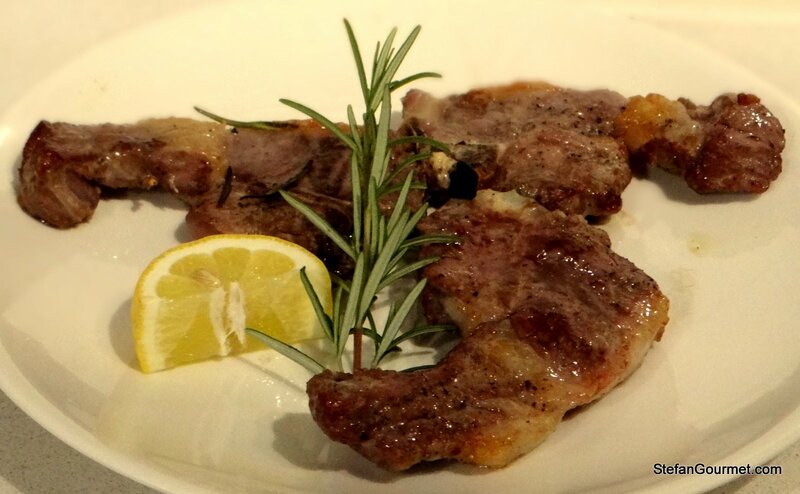 Scaloppine Saltimbocca refer to veal scaloppine that are so tasty that they “jump into your mouth”, and these lamb chops Scottadito are do delicious that you burn your fingers (scotta = burn, dito = fingers) while eating them. The name is quite elaborate but the dish is not. It is Italian cooking at its best: good ingredients to which you do as little as possible. 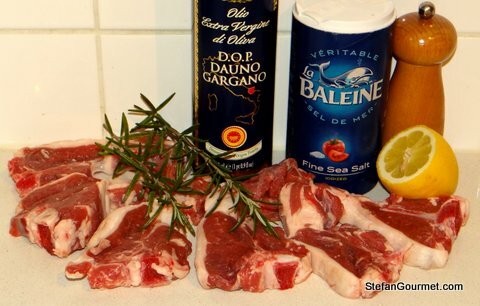 In this case lamb chops, extra virgin olive oil, salt, and freshly ground black pepper. 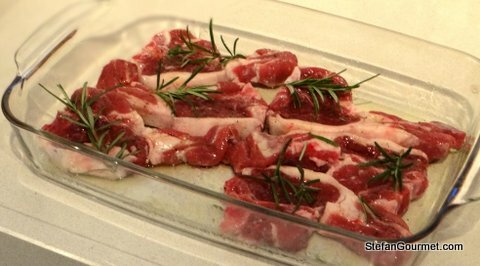 Optional ingredients are rosemary and garlic to marinate the lamb, and a slice of lemon to serve them with. The lamb can be prepared on a piastra (cast iron plate) or, as I did in this case, in a very hot oven. A cast iron plate will probably give slightly better results (better browning while keeping the meat pink inside), but is more messy. Note added 13 July 2013: the griddle does give a better result. 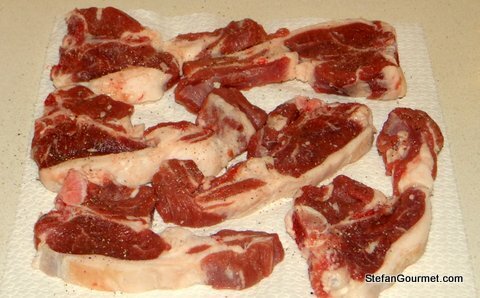 Pat the lamb chops dry with paper towels and season with salt and freshly ground black pepper on both sides. 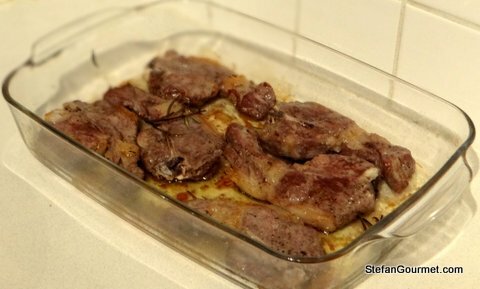 Put the lamb chops in an oven proof dish. Drizzle with olive oil and toss to coat them with a thin layer of oil on all sides. Add some rosemary and/or garlic if you like. Allow to marinate at room temperature for 30 minutes. Preheat the oven as hot as possible (250C/480F – 300C/570F). Roast the lamb chops for 10 minutes. Turn them and return them to the oven. Cook for another 5 minutes or until nicely browned but still pink inside. Serve at once, piping hot on warm plates, with a bit of lemon if you like. I will be posting a recipe for lamb shoulder “brodettato” later this week that is quite similar to what you are describing. A lamb shoulder roast is very flavorful, but it needs to be braised with very low heat (or cooked sous-vide). I love the simplicity of this dish. And I enjoyed your explanation. Happy Easter ! Lovely simple dish Stefan. Quality ingredients, simply cooked. Excellent. Thanks and Happy Easter to both of you, too! Yum. Perfect Easter dish. Simple is best when you have such good flavors to work with. You are hitting me close to my heart with this dish, Stefan. I love lamb and especially lamb chops. These sound exceptionally good. This is quite similar to my family’s preparation for all of their meats. 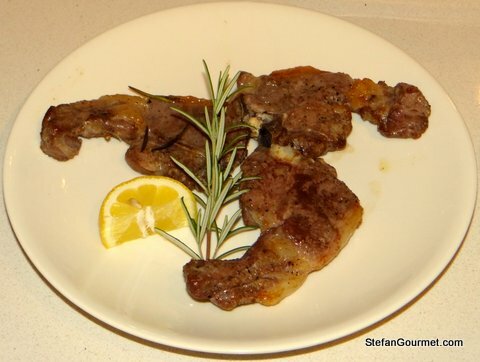 In fact, I’ve got photos of lamb chops that Zia prepared, waiting for me to write the post. Yours look every bit as delicious, Stefan. I bet you enjoyed them; I know I would have. Hope you and yours had a wonderful Easter. That’d be nice, I can’t remember a post from you about something that Zia prepared (but then again I still want to go through ALL of your older posts). Our Easter was great, except for the cold. Can you believe it was a lot colder than it was for Christmas? We even had snow for Easter! Hope you and Zia have had a great Easter, too. I think I’ll use the piastra next time.